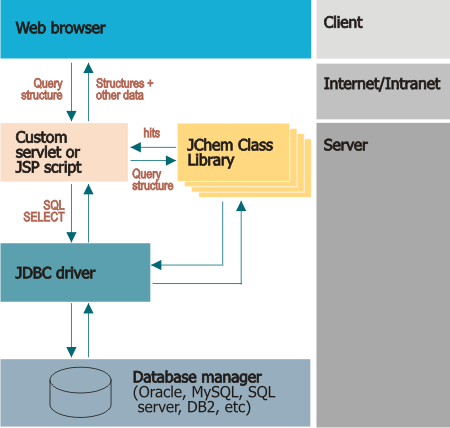 JChem Class Library is a collection of Java classes, which provides the functionality of handling JChem structure tables in relational database management systems (RDBMS-s) for Java applications. Java Development Kit version 1.6 or later. A relational database engine (RDBMS) that stores the structures in tables. The database server doesn't have to be installed on the same machine as the application if the computers are connected in a local network (Internet connection is also sufficient, but the speed of such system might be low). A JDBC or an ODBC driver for the database engine, which is compatible with the applied version of Java Virtual Machine. The driver has to be installed on the same computer as the application. If you don't have a driver, search for it in the Internet site of the RDBMS vendor. See FAQ for more details on JDBC and ODBC drivers. A web server (in the case of web applications). Tomcat web server (or Tomcat as servlet server integrated into Apache, IIS, or Netscape) This web server is recommended as having the best support for JChem base functionality. Most servlet servers can also handle Java Server Pages (JSP) scripts that are HTML pages with embedded Java code running on the server. Moreover, separate JSP engines that can be connected to servlet servers are also available. If you are going to develop an ASP application, then Microsoft's Internet Information Server is needed to be set up. ASP scripts can access JChem through a .NET bridge. The JChem package contains examples for JSP. JChemManager for creating structure tables, importing and exporting structure files, and for describing the properties of the RDBMS. For access rights to repository.chemaxon.com, please send a request to maven-repo-request@chemaxon.com. We also suggest to use Encrypted Password in settings.xml. For details see the Artifactory documentation. It uses JDBC technology to store and retrieve structures in relational databases. Most database engines (like Oracle, MySQL, MSSQL Server, MS Access, DB2, PostgreSQL etc...) can be used to store structures. Structural and other chemical or non-chemical data can be handled together. SQL statements can access structural data. Java modules are supplied for chemical structure searching. Fast and reliable search that can be built into custom systems. Web access to structure querying. Structure search and data manipulation can be handled by Java servlets and scripts that access Java classes or JavaBeans, like JSP (Java Server Pages). Structure search can be built into legacy databases. Structure input/update/display by the Marvin Java Applets and JavaBeans. Java application for table creation and SDF/Molfile/SMILES import/export. Communication with other chemical applications. Using a web browser, the user enters a structure into MarvinSketch. The script retrieves mixed structural and non-structural data by SQL SELECT statements, using the list of hits and tables or views in the database. The script creates the page that displays the retrieved data in the client's browser using MarvinView . Please note that there are other possibilities for invoking substructure searching, which might better suit your demands. Create the JChemProperties table automatically by invoking JChemManager the first time. This table stores information on the database and the structure tables. Set advanced options, if necessary. Import a structure file into the table (if needed). See the documentation of JChemManager for more details. To support drawing and displaying chemical structures in standalone, rich-client or Java Web Start applications, JChem is bundled with MarvinBeans. Marvin applets are recommended for applying in the interface of chemical web applications. Development issues and examples of using these tools are available in the Marvin Developer's Guide . However, you can also apply other chemical GUIs that import and export structure file formats recognized by JChem. Java classes in JChem may use ConnectionHandler or the java.sql.Connection class passed as a parameter to connect to a database. If parameters of the connection are saved in JChemManager then they can be reused from code. Java examples are available in Java and HTML format. Cache identifiers are introduced in JChem 5.3.2 in order to better scale search and database performance and improve safe and efficient structure cache load. Caches - or more precisely, cache pools - are identified with a cache ID. All the caches get the same cache ID if they belong to the same cache pool. This way the cache ID identifies the cache pool or - what is equivalent to this - the JVM. By default all cache pools get a random cache ID (this ID can be modified in case of permanent caches - see #3 ). In order to run a well performing search application, the cache ID must be registered before the first search. The registration process inserts a record into the cache registration database table (its default name is [JChemProperties table name]+"_CR", eg. JChemProperties_CR). If an application hasn't been registered before the first search is performed, it tries to register itself automatically but it may fail if the database connection is used in a transaction. Before closing your application (quitting the JVM) please always unregister your cache! There is only one exception to this rule: if your cache is permanently registered you may restart your application and simply set the previously registered cache ID (see #3 ). No re-registration is needed in this case. The registration of a temporarily registered cache may be deleted automatically after 1 day of inactivity (that is, no searches have been initiated by the cache pool in the last day). After deletion, the cache should be registered again. The default cache registration is temporary. Permanent cache registrations do not expire and can be unregistered only via the API (#4 , #5 ). Permanent registration needs a unique cache ID that can be set or can be given at registration (#2 , #3 ). Please use permanent registration only if your application is continuously running (e.g. server applications). An unregistered cache always reloads its structure cache before every search, so it's recommended to register at the startup of the application! Registration should be done outside of a transaction. CacheRegistrationUtil is designed to handle registration process. For registration operations a connected ConnectionHandler (ch in the examples) is needed in almost every case - except when setting a permanent cache ID (see #3 ). By default the registration will be temporary, using the default random cache ID. If a permanent cache ID (see #3) was set before, the registration will be permanent, using the given ID. a) Changes the default cache ID to identifier. b) Registers identifier as permanent cache ID. The second line changes the default cache ID to identifier and sets the cache registration type to permanent, so subsequent calls to registerCache() (see #1) will register the cache as permanent! Unregisters the current cache's cache ID. Unregisters the given cache ID (temporary or permanent). Structure tables used by JChem reside in databases of RDBMS-s. See the administration guide for more details on managing these tables. using objects from the JChem Class Library. An initialized java.sql.Connection object, usually contained in a ConnectionHandler object. The name of the structure table. In the case of RDBMS-s supporting schemes, the owner of the table should also be specified followed by a dot before the actual name of the table (e.g. : cduser.structures). If you are unsure about the name, check the content of the JChemProperties table in the database. Though structure tables can be manipulated without using JChem's classes, you must be careful not to harm the integrity of the database. Only custom data fields of jchem tables are allowed to be manipulated directly by SQL statements - otherwise the JChem API must be used. Java examples for creating database tables using JChem API are available in Java and HTML format. It is suggested to setup and try one of the demos included in the JChem package before starting the development of a custom application powered by JChem.